For all the visual thinkers out there - now you can brainstorm your ideas in SpiderScribe.net and then easily link your mind maps to 5pm projects and tasks. 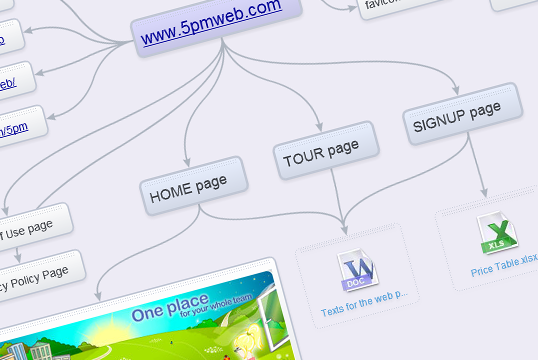 SpiderScribe is a great mind mapping and brainstorming app that lets you connect text notes, documents, files, pictures, links, events and geographical location into free format maps - like the example above. You can share and collaborate on those maps online. Plan your projects - start with the "big picture"
You can easily connect your SpiderScribe maps to 5pm projects and tasks using Add>Link SpiderScribe maps in the right panel of the main view.